People often ask us what size footings do they need to concrete the carport posts into the ground. How big the footings or foundations are depends on several factors. The width or diameter can vary from 350mm wide to 600mm wide, with the depth varying from 750mm to 1.5m and more. The simple answer is there is no standard size of footing provided to anchor a carport into the ground. The footing size is determined by the size and height of the carport, the post size, the design and engineering of it, as well as the wind region in Australia. Don’t assume that footing sizes have a standard size in building. For example the footing size used for a fence will not work. The 2 structures are very different and so the amount of dead load and wind load is different. The only thing holding a carport to the ground are the posts and footings. They have to cope with not only supporting the weight of the carport, but also the constant pushing, pulling and twisting action caused by the wind. A bigger carport that has a larger roof area needs more support. If bigger posts are needed, then bigger footings are required. A carport’s height can affect how far the post goes into the ground.The higher the carport, the more in ground support and holding it needs. In the other words, the higher the carport is, the deeper the footing generally needs to be. In the past, some had used a general rule of thumb ratio of 3 to 1 particularly for taller carports (eg. 3.9m high carport means there was 1.3m of posts into the ground, a 3 to 1 ratio). It can be a good starting point, however follow the engineer’s recommendations. They have the experience and know how to calculate it correctly. In simple terms, the larger the post, the larger the footing. 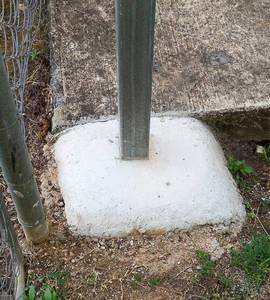 If a larger diameter post is used, you need to make the footing wider, so that there is adequate concrete surrounding the post. You will also tend to find that the footing is also deeper with larger posts. This is usually a side effect of the size of the carport, because larger posts are needed to support a larger roof area or a higher structure. For example, a carport kit to suit a caravan, motorhome or boat tends to be higher than a carport to suit a car. The increased height means more support and bracing is required to hold up the roof. You achieve this with larger posts. The higher the wind region the faster the wind blows. You then need more bracing to hold the structure in place. One way to do this is to increase the size of the posts and footings. Obviously you use concrete, but did you know there are different types of concrete. Here are some quick tips. Check the engineering. Here it will give you information about what concrete strength etc. to use. Do whatever is specified by the engineer or stronger. Eg. if 20mpa concrete strength is called for, use at least some concrete rated at 20mpa. Personally, we would use 25mpa and stronger, but if the engineer calls for more, do that. Note: DO NOT use any form of rapid setting concrete. It is usually way below the strength needed because of the mix and curing agents used. Make sure the concrete is throroughly mixed. Don’t just throw some dry bags into the hole and pour water on top. Chances are it won’t mix properly, and you will end up with a sub-standard footing. After the footings are filled, form the top of them for a better finish. Concreters have various screeds and trowels, but you can still use anything with a flat surface to finish off. Make a dome shape or bevel the edge. This is so that the water runs away from the post, towards the ground. This not only looks nice, but prevents water pooling around the posts, which can lead to premature rusting. Useful Tip: When you place the posts into the holes, make sure you fit the supplied pieces of reo bar or threaded rod into the bottom of the posts. This is done to effectively ‘tag’ the concrete in the footing and pull against the weight above it. It helps to combat uplift forces – so your carport doesn’t blow away! Useless Trivia: Most people, when needing concrete, simply order in a concrete truck. Did you know that it’s not unusual for a skyscaper or high rise building to have it’s own batching plant on site to make concrete. They need so much concrete for the footings and piers just to get out of the ground.